This machine can be used to fill Water, Solvents, Alcohol, Liquid , Pesticide Liquids, Biotech Liquids, Coolants,Pharmaceutical Formulations,Juices, Coconut Oils, Edible & Lubricating Oils etc. Very Low cost Machine. Volumetric piston filling technology This machine is operated with Three phase motor & Gear Box. Facility of speed control with variable frequency drive. Capable of filling upto five liters with buzzer alarm. Facility of production count Available with GMP Models. Filling Range 50 ml to 250 ml. & 200 ml to 1.0 Ltr .with suitable change parts. Diving nozzle mechanism avoids foaming & spillage. Available as standalone Machine. And also as complete Auto-line with 2,4,6 & 8 Filling Heads. This filling machine is best suited for viscous products that are paste, semi paste, or chunky with large particulates. These machines also used to fill heavy sauces, salsas, salad dressings, cosmetic creams, heavy shampoo, gels, and conditioners. They are also used for viscous, chemical preparations like paste cleaners and waxes, adhesives and epoxys, heavy lubricant oils, greases & Honey etc. Volumetric piston filling technology PLC controlled system. Heat resistant & Corrosion Resistant Pneumatic Cylinders for Special Applications. Filling Range 100 ml to 1 Ltr .without any change parts. Capable of multifilling up to 5 Ltrs. Same machine can be used for smaller volumes 10 ml to 100 ml with suitable change parts. Diving nozzle mechanism avoids foaming & spillage. Positive shut-off Nozzle helps in keeping the filling area clean. Available as standalone Machine. And also as complete Auto-line with 2,4 & 6 Filling Heads. 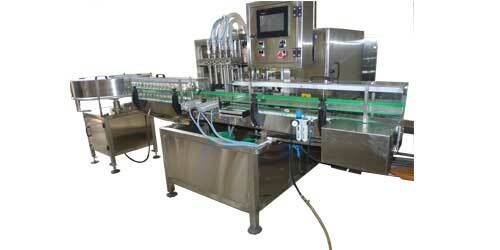 Our company offering high quality Bottle Filling Machines, Such are bottle filling and sealing machine etc. These machines work on the latest technology and offer high utility and effective performance to the clients. A vertical form, fill and seal machine for producing 3/4 side sealed sachets handling all types of viscous products. The machine speed is infinitely controlled from 0-50 cycles/ minute. Single reel film laminate stock reel feed. Max. reel dia. 400 mm on 76 mm core. Product dosing by piston pump with reciprocating valve. All parts in contact with product are made of high quality stainless steel. Sealing dies gear operated, with complete pressure and temperature control on sachet seal area. This machine is most suitable for filling tooth powder, talcum powder, baby powder, dry syrups, coffee powder and food, pharmaceutical, Powder Fertilizers, chemicals or cosmetic products in powder form. Compact design Standalone and automatic lines configurations Variable speed drive for stirrer Stainless steel (SS 316/SS 304) contact parts and externals are claded Quick-release tool-free auger and funnel removal Independent stirrer drive Less tools for removable change parts Large capacity hopper Also available in GMP Models. Filling Range 10 Gms to 1000 Gms (1.0 Kg) Upto 5.0 Kg on request. Speed 100 Gms-20 BPM, 500 Gms-15 PPM, 1000 Gms-10 PPM (Depending upon product properties, fill weight ) Special model with servo motors instead of clutch / brake unit available for better output & accuracy.